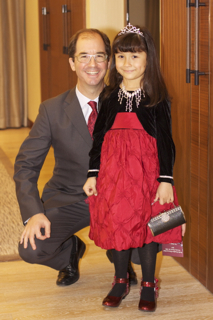 Little Miss was all dolled up for the occasion with an evening gown and velvet cardigan that I got in Nihong Kids Market, she choose the red high heel shoes from the same place. I’ve got her toys diamonds jewellery and purse to complete the look and voila, we have a Princess ready for the ball. TRULY A PRINCESS! And so much beauty! More and more like her Momma! Muchas gracias, she is growing too fast for me, a little lady in the making!